There's no place like home for inspiration. 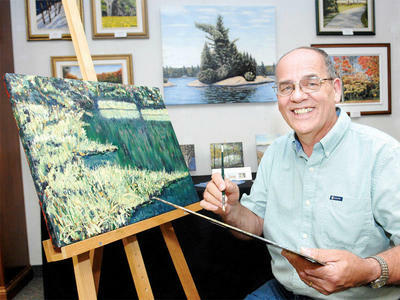 ARTIST AT WORK: Ian Ridpath works on his latest piece, "Towards the Bay" - depicting Mountsberg Conservation Area - while some of his other paintings hang in the background. Photo - Graham Paine / Canadian Champion. Stop by the A.M. Gallery at Milton Mall and chances are you'll see resident artist Ian Ridpath at work creating. Chances are also pretty good you'll recognize some of the locations depicted on canvas, with Crawford Lake and Mountsberg conservation areas and the Mill Pond all featured prominently. "I get inspired by what's around me," said the oil painter. "I traveled extensively, but there's nowhere else I'd rather paint." Since the gallery - a collaboration between the Fine Arts Society of Milton (FASM), Arts Milton and Milton Mall - opened last September, Ridpath has completed 20-something pieces at the gallery. And since he retired last year and picked up his paintbrush after setting it down many years ago, he has finished 35 works. Retirement - which came about rather unexpectedly, after Ridpath was laid off from his job in electronics - has opened the door wide to the world of art, and Ridpath has found himself with not just the time to paint, but now, with the A.M. Gallery, the space too. It's something he wouldn't have otherwise, living in a condominium. It's a Thursday morning, and Ridpath is finishing up a lesson with a student - his first ever, another opportunity afforded him by the gallery. His paintings line the wall in the front portion of the space. Every so often a member of the public wanders in to browse leisurely or ask a question or two of one of the artists displaying this month (every month, with the exception of Ridpath, there's a new batch of artists). The gallery has been a great way to attract newcomers to FASM, which has enjoyed an increased membership since it opened, said Ridpath, a fairly new member himself. It helps new and experienced artists alike gain the exposure that can be so difficult to get, and gives the public a casual venue in which to browse and maybe even purchase a piece of local talent. "People buy for two reasons: they recognize the scene or it strikes them - something about the painting captures their imagination," he said, adding with a chuckle, "It's very satisfying when someone appreciates your artwork besides yourself and your wife." Ridpath specializes in impressionist-style oil landscapes on canvas, working from photos he's taken of places he finds inspiring. He also does commissions, giving clients a chance to have their cottages or other favourite places captured. Canadian winters are long, Ridpath said, and people like to have a special summer or fall scene to look at above their mantle when they can't be there in person. One painting he's currently working on is an iconic Ontario scene of a wide, open field with bales of hay and a cloudy, blue sky. "It's just a nice scene - one we see all summer," the artist said. Because oil paints take so long to dry, Ridpath usually has a few paintings on the go, moving to another while one dries. As for the season he most enjoys painting, it's without a doubt autumn. "Our winters are too white, our summers too green and our springs too brown, but autumn has every colour," he said. Fall may be fleeting, but the fact he works from photos means he can paint a harvest scene full of yellows, reds and oranges whenever the fancy strikes. Art seems to run in Ridpath's blood, with his father, grandfather and five older brothers all involved in some capacity. "We were raised to appreciate art," he said. So it's no surprise that he was already sketching and working in pen and ink as a child. But, as often happens, Ridpath set aside his creative pursuits to raise a family. It wasn't until the mid-1990s, about 30 years later, that he picked it up once again, deciding to take some lessons from one of his brothers. The Group of Seven are among his biggest influences, and play a part in what Ridpath jokingly calls his family's "claim to fame," which is that some of the Group of Seven artists sat in chairs from his father's furniture company, which he delivered to The Arts and Letters Club in Toronto, a now centuries-old gathering place for artists. "Group of Seven bums sat on Ridpath furniture," Ridpath said with a chuckle. His father was even acquainted with some of the legendary members of the group and would sometimes chat with them at the club. But Ridpath is under no illusions that his family history somehow makes him a natural-born artist with no need to constantly work on his craft. Just how long does it take to learn to paint? "A lifetime," Ridpath said. "This you don't learn to do overnight." The A.M. Gallery is open Thursdays, Fridays and Saturdays from 10 a.m. to 6 p.m.
Ian Ridpath does not necessarily agree with or endorse all aspects of the Google ads shown on this website. All images, text and layouts on this website are copyright (c) 2009, 2010, 2011, 2012, 2013, 2014, 2015, 2016, 2017, 2018 by J. Ian Ridpath.